Candy Corn was invented in the 1880s by George Renninger and the Wunderle Candy Company, but later mass produced by Goelitz Candy Company, now known as the Jelly Belly Candy Company. Originally, candy corn had to be made by hand, each color being added on separately and molded into shape. Because of how time consuming this was, they decided to make this a seasonal candy, like how crops were harvested seasonally. With this and the shape, Candy Corn came to be. Since then, Candy Corn has been made into different variations. Kernels with brown tops, called Indian Corn for Thanksgiving, and even red and green “corn” for Christmas. This “mellocreme” candy has also been made into pumpkins. Regardless of what it’s been made into, over 35 million pounds will be made this fall. That’s roughly 9 billion kernels will go into candy dishes and treat bags. You’ll even find candy corn flavored products, from cookies, drinks, even bagels! 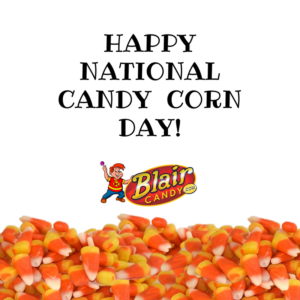 Grab a small bag or a bag of bulk candy corn on BlairCandy.com today to celebrate! While you may be aware of some of the origins of Halloween, do you know about the most important part of Halloween? Not the decorations or the costumes…the candy! Here are a few candy facts about Halloween candy to share with your friends while passing out, and enjoying, candy this year! 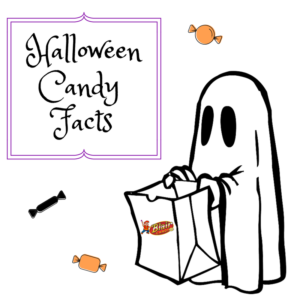 -Roughly 140 million people will buy candy for Halloween this year, which ends up being around 600lbs of candy. -In 2013, Reese’s beat out M&M’s to be the most popular Halloween candy. -You can freeze your leftover candy! Chocolate candy can stay good for about 6 to 8 months if sealed tightly in the freezer. -About 35 million pounds of Candy Corn (also known as Chicken Feed) are produced each year. -Every state has its own popular Halloween candy. For instance, Floridians prefer Crunch Bars, Alaskans enjoy Snickers bars, and Texans really love candy corn according to consumer trends. -Those who hand out candy tend to go towards their favorites. Roughly 62% of Americans give out their favorite kinds of candy to trick-or-treaters. 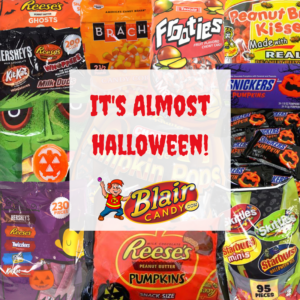 Regardless of how you celebrate Halloween or what candies you choose, you can find everything you need on BlairCandy.com! 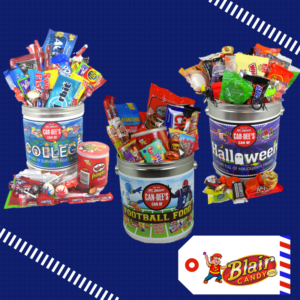 Visit us today to snag your favorite Halloween candy treats before the trick-or-treaters show up! Halloween S’Mores Dip. If you have Halloween peeps, chocolate candy, and graham crackers you are set to make a delicious and festive dip. Check out how to make it on The Decorated Cookie here. Reese’s Spider Cookies. If you have a cookie mix, some miniature Reese’s cups, and a steady hand for piping chocolate, you’re set. See these pretty cute spiders on Mommy Musings Blog here. These eyeballs will have everyone creeped out. All you need is food coloring, rice crispy treats, and candy eyeballs. See the recipe on Two Sisters Crafting here. If you can make brownies, this recipe has you covered. All you have to do is ice them and add eyeballs and you have Mummy Brownies! See the recipe on Pretty Providence here. Be sure to tag us in any treats you make! You can get the candy parts of these recipes at BlairCandy.com. While you’re there, make sure you have plenty of Halloween candy for the trick-or-treaters (and yourself!) 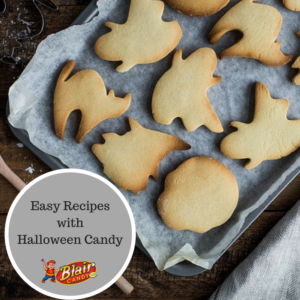 for a sweet and easy Halloween! Fall vs. Halloween: Which Peeps Do You Choose? It’s funny to think that Peeps used to just be an Easter candy when they now have flavors and types for all holidays now. With Halloween around the corner and fall in full swing, we thought it was time to break out the fall and Halloween Peeps. But which do you choose? Fall Peeps: These are shaped into the classic chick shape that Peeps are famous for, but are flavored into different fall flavors. Choose from pumpkin spice, caramel apple, and candy corn flavors instead of the plain flavors we’re used to. These chicks are also dipped in either caramel or white chocolate, really stepping up the game for Peep flavors. Halloween Peeps: These peeps are the more traditional flavors you’re used to. A fluffy marshmallow with a coating of fine, sweet sugar is what you’ll find in these packages. But, these Peeps are shaped as your favorite Halloween characters. 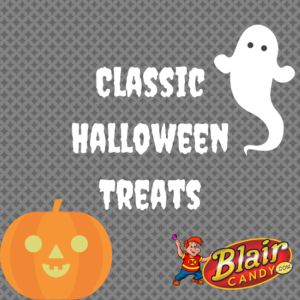 Choose from ghosts, Frankenstein heads, tombstones, and pumpkins for a fun treat! So which will you choose? 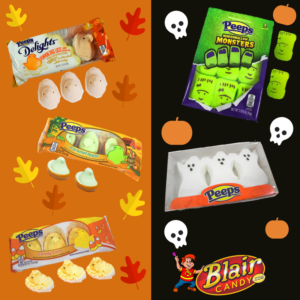 Grab your Halloween and fall peeps today for a festive treat. If you make anything out of your Peeps, be sure to tag us on social media! Shop all Peeps now at BlairCandy.com. Buy Halloween Candy: Don’t deal with all of the other people who forgot to buy candy the day of Halloween and grab a bag or two when you’re at the store next time. Or better yet, just visit BlairCandy.com, order your candy, and have it delivered to your door! 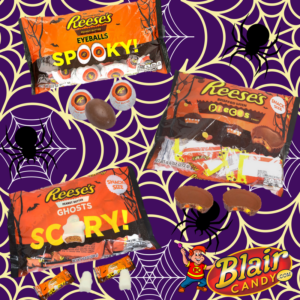 Get a mix of chocolates, lollipops, and Halloween gummy candy and you’ll be good to go. Make Sure the Kids Have Costumes: Avoid Halloween mega meltdowns and check now with your kids to figure out what they want to be for Halloween. If they want to reuse a costume, just make sure it fits so there isn’t a last minute panic. Put Up Decorations Outside: Whether it’s a pumpkin or two, a wreath on the door, or a ghost hanging from a tree, just add some decorations outside. Trick-or-treaters will know to come to the door and your kids will have fun decorating for Halloween in the process. Halloween should be fun, so cross multiple things off the list by just following these three simple steps. For the candy part of your holiday, visit BlairCandy.com! You can get mini candy bars, Halloween lollipops, and Halloween gummy candy all in one place. 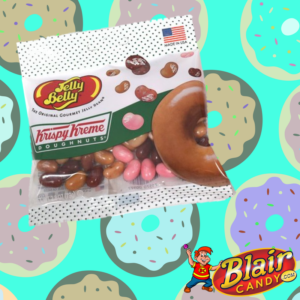 Jelly Belly has always had unique flavors, but if you love Krispy Kreme then you have to try these. This bag of Jelly Belly beans are flavored as your favorite Krispy Kreme doughnuts. Know someone who loves Pez candy? Or are you a Pez lover? Either way, this retro tin of Pez candies has 53 candy refills and a retro dispenser. Chocolate rocks are cool to decorate desserts with or eat alone! This bulk bag will make sure that you have plenty for candy crafts. There’s plenty of candy in bulk for you to try and discover on BlairCandy.com. Try something new and leave us a review to tell us if you loved it. Shop all of our new candy in bulk today! Halloween popcorn balls are a trick-or-treating staple that is pretty versatile. You can make them savory, sweet, decorate them, or keep them simple. If you decide to make them, just make sure you have enough because they’ll go quick. Check out the recipe by Thirty Handmade Days here if you don’t feel like making them, check out our Halloween popcorn balls by clicking here. Pumpkin patches, graveyards….they all require the classic dirt pudding recipe. Chocolate lovers have made and loved this recipe for years. Decorate with gummy worms, cookie tombstones, or marshmallow ghosts for a cute dessert. Check out the recipe on Oh! Nuts Sweet & Crunch Blog here. Meringues are a little harder to pull off, but if you do, they make the perfect ghosts. Eat them alone or use them to decorate desserts, they make the perfect touch to any Halloween. Learn how to make them, on Smart School House here. Be sure to tag us in your creations on Facebook, Instagram, or Twitter! 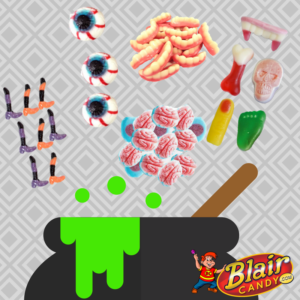 Visit BlairCandy.com today to get all of the candy and supplies you need for your Halloween creations.